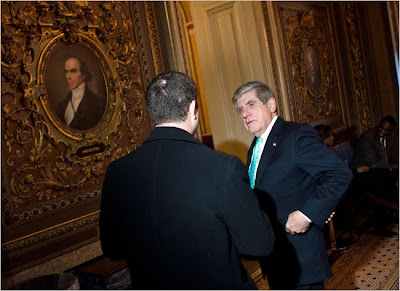 Sen. Ben Nelson came through late last night and now the Republican filibuster is busted! I wonder if Sen. Olympia Snowe will follow suit as well? This is the final hurdle for Health Care Reform. The House will now bite the bullet and "ping-pong" the bill - approving it as is - and thus not allowing Republicans another chance at a filibuster. Then the bill will go straight to Obama without going back to the Senate. This has been a good end of the week for Obama. His health care legislation is set to pass and an agreement was reached at the climate talks in Copenhagen. I am optimistic right now that either Ben Nelson or Olympia Snowe will provide the 60th vote needed for cloture on the health care bill. At this point I think we are just watching the end of a long, slow dance that has already been choreographed behind closed doors. Right now if I had to bet, I would say that the best odds are on Olympia Snowe to step up. There is no reason at this point for her to oppose the bill since it is essentially the same as the bill that came out of the Finance Committee which she already supported. The public option and Medicare buy-in proposal that she objected to in the interim period have been stripped away. The question is what would Nelson do at that point? I think once the filibuster is moot, he will vote to end cloture but still vote against the bill. Thus the cloture motion will pass 61-39. Earlier this morning a final hurdle was cleared when Democrats defeated a Republican attempt to filibuster the Defense Appropriation bill. Sens. Snowe, Collins and Hutchison all broke ranks to support the troops, while the rest of the GOP hypocrites did what they usually do. I know it sounds arrogant to say that people don't know what they are talking about when it comes to climate change, but as Gene Lyons points out in this essay, we wouldn't expect to get lectures on physics and chemistry from talk show yakkers and the like. But what about Al Gore, you say? What does he know? Nothing, of course, but that's just the point. Gore is not spouting opinions off the top of his head. He is referencing well established scientific studies, not industry propaganda. So what's next? A series of essays by Sarah Palin about the Large Hadron Collider and the mysteries of dark matter? An MIT lecture series by Rush Limbaugh regarding the thermodynamics of black holes? A Festschrift of Sean Hannity's scholarly articles on plate tectonics and volcano formation? Glenn Beck performing live heart-lung transplants on Fox News? Everybody understands that these things couldn't happen. That when it comes to serious scientific endeavor, years of study and professional apprenticeship are required. In a word, expertise. Ex-beauty contestants, drive-time DJs, TV sports announcers, hairstylists, newspaper columnists -- basically anybody whose math skills topped out in the 10th grade -- rarely have anything substantive to add to the sum of technical and scientific knowledge. That's what they most resent about it. It's not impossible that such persons could educate themselves sufficiently to have an informed opinion, but it's rare. Most of us, most of the time, are like historian and blogger Josh Marshall: "The fact that the vast majority of people with specialized knowledge in the field think there's a problem is good enough for me," he wrote. "I can't be knowledgeable about everything. And I'm comfortable with the modern system in which the opinions of really knowledgeable people with expertise counts more in cases like this than people who know nothing at all." Unless and until, that is, scientific endeavor impinges upon either A) religious belief, or B) the ability of tycoons to keep making money in precisely the way they or their ancestors have always made their money. Then it's every man and woman a climatologist, and every genuine expert an "elitist" enemy of God and the American way -- creationism with a thermometer. First Great Premise: Any theory is valid if it moves units ... Second Great Premise: Anything can be true if someone says it loudly enough ... Third Great Premise: Fact is that which enough people believe. Truth is measured by how fervently they believe it. So it was after thousands of private e-mails hacked from the University of East Anglia Climatic Research Unit in England emerged via the right-wing noise machine into the British and American press. Caught red-handed acting like, well, like professors -- ambitious, idealistic, petty, egotistical, dogged and pedantic -- climate researchers soon got caught up in a media storm rivaling that surrounding golfer Tiger Woods. Within days, representatives of various Exxon- and Koch Industries-funded propaganda shops like the Heritage Foundation and Competitive Enterprise Institute started braying about "Climate-gate." Fox News headlined "Global Warming's Waterloo." Hannity told viewers, "Now we find out that this institute is hiding from the people of Great Britain and the world that, in fact, climate change is a hoax, something I've been saying for a long time." Taking time off from her book tour, Sarah Palin wrote a Washington Post piece charging the "e-mails reveal that leading climate 'experts' deliberately destroyed records, manipulated data to 'hide the decline' in global temperatures, and tried to silence their critics by preventing them from publishing in peer-reviewed journals." Note the scare quotes around "experts." Palin's evidence for this conspiracy? Here's the worst of it: A 10-year-old e-mail from professor Phil Jones to Penn State colleague Michael Mann. You've seen it 10 times on television. "I've just completed Mike's Nature trick of adding in the real temps to each series for the last 20 years ... to hide the decline." Read it twice. So Jones brags about hiding a decline in global temperatures by "adding in the real temps"? The allegation's nonsensical on its face. If you read the entire message, Jones is talking about plotting a more accurate graph by throwing out inferential evidence from tree ring studies known since the 1960s to be less reliable. There's an elaborate scientific debate about why. Not one reputable scientist who's looked into this matter has judged otherwise. What's crucial to understand is that if Jones were proved to be faking data, his scientific career would end at once, along with that of anybody who helped him. Scientists can be jerks too. However, the kind of worldwide conspiracy conjured by global climate change deniers like Palin, Hannity and the rest -- that is, as an evidence-free, religio-political cult that's the mirror image of their own movement -- simply can't exist in a scientific context. Meanwhile, Arctic sea ice is vanishing, glaciers melting, sea levels rising, droughts and floods increasing, and the past decade -- according to the World Meteorological Organization -- was the warmest in recorded history. But hey, look over there: some elitist e-mails! 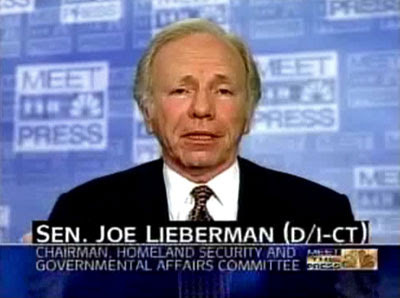 Joe Lieberman has burned more bridges with his old party than any politician probably since Theodore Roosevelt. On an emotional level, I agree. I was ready to toss Lieberman overboard the minute he endorsed and campaigned for McCain/Palin in the '08 election. But the one thing to remember about Lieberman after everything is said and done is that he is going to end up voting FOR healthcare reform and that is more than can be said for any single Republican. Even with the public option dead and the Medicare buy-in compromise stripped from the bill, it still doesn't have a single Republican willing to vote for it or even to allow it to go to a vote. So, as bad and as infuriating as Lieberman is right now, he is still better than any of the so-called "moderates" in the Wingnut Party. Every single one of them - Olympia Snowe, Susan Collins, George Voinovich - they are all not only going to vote against the bill, they are supporting a filibuster to prevent it from even coming up for a vote. There are three major reasons why Healthcare reform has taken so long and is struggling so hard despite overwhelming support in the House and Senate. The first reason is pure political spite from the Republican Party which is only interested in defeating anything and everything that Obama tries to do so as to make him look bad and weaken him before the 2012 elections. The second thing is the filibuster which has evolved and metastasized into a gross, enormous tumor on the body of our American Democracy. The Republican Party's abuse of the filibuster rule is destroying our democracy as we have known it. The fact that legislation supported by overwhelming majorities in the House and Senate can't even come up for a vote is outrageous. The filibuster rule needs to be cut back to what it once was in the 1970s and '60s and before - a rarely used procedure requiring some amount of effort or sacrifice on the part of those opposing the majority. Instead, today a filibuster requires no effort on the part of the minority party and instead puts all the onus on the majority to come up with 60 votes every time it is invoked - which today is on almost every single piece of legislation. And finally, you can blame the lobbyists who have poured millions and millions of dollars into campaigns to influence the votes of senators like Joe Lieberman who hails from a state with lots of insurance companies. The funny thing with Lieberman is that while he has incurred the wrath of his fellow Democrats once again on health care reform, to the delight of rightwingers, he is about to become a key player on the other side by pushing cap-n-trade legislation with John Kerry to address the global warming crisis. I suppose you can chalk that up to the fact that Connecticut has no oil interests to speak of, but does have many days a year where you want to put on a gas mask before going outside because of the smog rolling in from New York. However, at this point I don't know how much I would trust Lieberman to not backpedal and sabotage his own bill. This is still a huge achievement that will benefits tens of millions of people in very concrete ways and will do it without expanding our long-term deficit. Either with or without a public option, this is more than Bill Clinton ever did, more than Teddy Kennedy did, more than LBJ did, more than Truman did, and more than FDR did. There won't be many other times in our lives any of us will be able to say that. So pass the bill. Paul Krugman has a terrific column in today's NY Times. He gives a good rundown on the last several decades of deregulation mania that has led to one economic disaster after another. And then he goes on to talk about how it is so difficult to fix this problem when dealing with a Republican Party (and Blue Dog Democrats) who live in a Bizzaro alternate universe. The Republican Party today is not interested in governing the country. They are only interested in regaining power so they can go back to enriching themselves and their corporate puppet masters at the expense of everyone else. If voters allow this to happen, our country will sink so low that I'm not sure anyone will be able to pull us out the next time.